Wood Frogs have emerged from their hibernacula and migrated to their ancestral woodland breeding pools, or vernal pools, to sing (males), mate and lay eggs (females). A chorus of duck-like quacking reveals where these hidden temporary bodies of water are located. The male Wood Frog in this photograph is on top of a female, grasping her behind her front legs in a hold referred to as “amplexus.” They will remain in this position until she lays her eggs and he then fertilizes them externally. Note that even though he has attracted a female and is in the process of mating with her, the male is continuing to sing (one of his two vocal pouches is inflated on the near side of his body). This is the time of year when vernal pools become a main attraction for certain breeding amphibians and invertebrates. Most of these ephemeral wetlands, due to evaporation and transpiration, dry up during part of the year and therefore cannot support a population of fish. This makes them a highly successful breeding environment for creatures that need water in which to reproduce, for both they and their eggs stand a much better chance of surviving without predatory fish. The next Naturally Curious post will be on 4/18/17. Now that normal spring temperatures have returned, the air around vernal pools is once again filled with the clacking/quacking calls of male wood frogs hoping to attract females. Once this has been accomplished, most paired wood frogs head to the same general area in the pool to mate. The resulting egg masses, each consisting of several hundred eggs, form a communal cluster, or “egg matt,” on the surface of the water. Eventually algae will start growing on the jelly-like substance surrounding the eggs, causing them to resemble pond slime – an effective camouflage. The gelatin covering, the size of the communal cluster, and exposure to the sun all help the eggs to be warmer than the surrounding water and they develop quickly – a necessity if one is to metamorphose into an adult before the vernal pool dries up. With spring peepers (pictured) and wood frogs just coming into voice, and some salamanders also having recently emerged from hibernation, there is concern for their welfare due to the erratic weather we are having. According to Jim Andrews, Director of the Vermont Reptile and Amphibian Atlas, the effects of this meteorological fluctuation depend on the exact climatic conditions experienced, as well as the species affected. Wood frogs and spring peepers, as stated in a recent post, are well equipped to survive the cold weather. However, egg-laying has already taken place in some locations and if the eggs are exposed to the air, as opposed to being attached to a submerged branch or vegetation, and it’s cold enough, long enough, they will freeze. Many of the mole salamanders, including spotted, Jefferson, and blue-spotted, are in the middle of migrating to or from their annual breeding pools. Faced with freezing temperatures, they retreat temporarily into the leaf litter and thawed soil beneath, a sheltered environment where they spend all of their life except the breeding season. An extended period of cold that freezes the ground would pose problems for these creatures, although Andrews has witnessed the survival of a blue-spotted salamander that sought shelter under rocks that were on top of frozen ground. Many factors are involved in the effects of this phenomenon – how warm it was before the cold spell arrived (long enough for hibernating amphibians to emerge? ), how low temperatures go, how long it remains cold, the species of frog or salamander, and where it is in its breeding cycle. The peeping and quacking we briefly enjoyed has been silenced, but not permanently and hopefully not for very long. Wood Frogs mate and lay their eggs in ponds and occasionally vernal pools before heading back to their terrestrial, wooded habitat. Amphibian eggs are subject to predation by numerous predators, including leeches, fish, aquatic insects and salamanders. Eastern Newts (aquatic as larvae and adults) are carnivorous and consume insect larvae, fingernail clams, leeches and amphibian eggs, among other things. 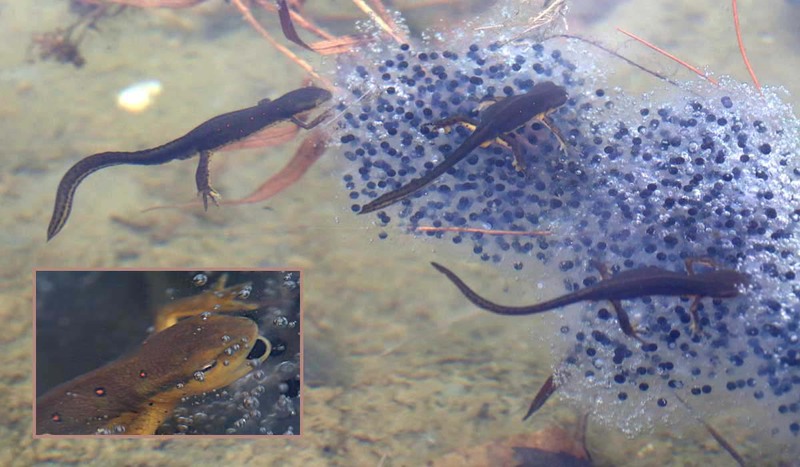 At this time of year, Wood Frog eggs are plentiful and easily accessible, as the individual masses, each consisting of 1,000 to 2,000 eggs, are deposited adjacent to each other on submerged vegetation. Hungry newts can feed for hours without moving more than an inch, and many often do. After discovering an egg mass, a newt plunges its head into the clump of eggs, grabs one and, with great shaking of its head, separates an egg from the mass and quickly swallows it. Seconds later the newt repeats this process, and continues doing so until it is satiated.